WE DO NOT HAVE PUPPIES AVAILABLE. 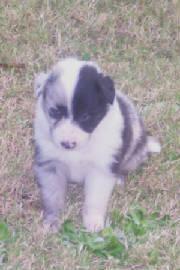 A pup from one of our very first breedings!! We only allow our puppies to go to approved homes. We really like to see our puppies go into working situations, as that is what we breed for. Occasionally we have puppies and dogs available that would do good in home or family situations. We raise our puppies to perfection. We make sure each pup gets well socialized, oriented with people and surroundings, and are handled daily since day 1. If you are interested in any of our puppies please contact us for approval.